Econet Zimbabwe is set to introduce Twitter bundles to Econet broadband subscribers. This emerged after Econet started a campaign on their Twitter account asking followers to retweet if they want Econet Twitter bundles. The Twitter bundles will be a follow up to the highly popular Facebook and Whatsapp bundles the company introduced the in October 2013 and February 2014 respectively. 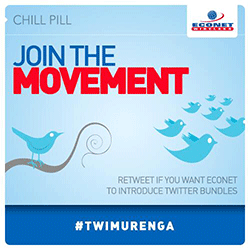 The Official Econet Zimbabwe twitter account is currently running a #Twimurenga retweet campaign where they are asking followers to “retweet if you want Econet to introduce Twitter bundles”. The Econet tweet goes on to say, “We are still a long way to go to reach our 1000 Retweets for #TwitterBundles #Twimurenga“. I made a quick call to Econet’s PR and got confirmation that their technicians are working to introduce the bundles but they could not be drawn to reveal any timelines. I strongly suspect that Econet is using the #Twimurenga 1000 retweets challenge to test demand for Twitter bundles. The 1000 retweets target is probably unprecedented by Zimbabwean standards but still modest in the context of “we will make Twitter cheaper for you if you retweet” and for a brand like Econet that has over 13000 followers. The original #Twimrenga tweet was made 19 hours ago and it’s steadily getting viral with close to 200 retweets. Whatever the outcome, brace yourselves #Twimbos, something you have calling for is coming – a 1000 retweets or not.